The five cartoons are available at archive.org. They are Betty Boop: A Song a Day (1936), Betty Boop: Is My Pam Read (1932), Betty Boop: More Pep (1936), Betty Boop's Ker-Choo (1932), Betty Boop: The Candid Candidate (1937). A sequence from Betty Boop is My Palm Read, 1932 (sampled at 10 frame intervals). X: time | Y: mean value (i.e., average gray scale value for each frame). Thik red line: Björk video. Other lines: Betty Boop cartoons. 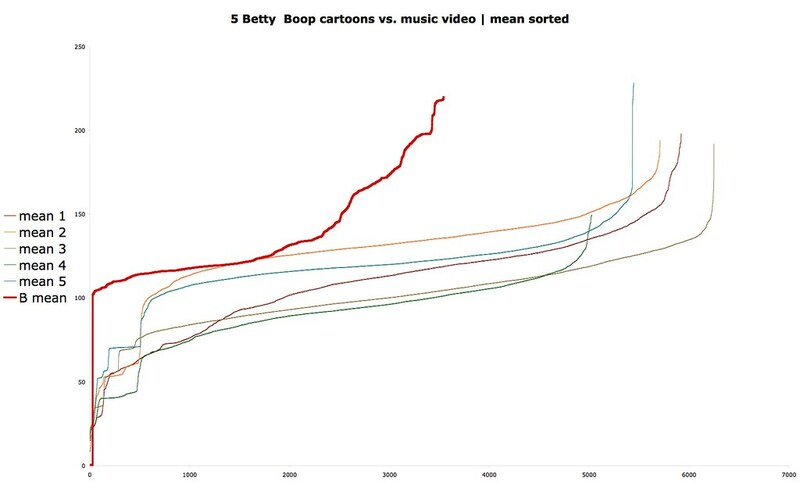 The graph does shows that the "temporal signatures" of Björk video - which in its techniques exemplifies motion graphics of the 2000s - is quite distinct from the cartoons of the 1930s drawn by hand and shot on animation stand. This is not a big surpise; but the graph does not tell us much about the relationships of the five cartoons to each other. X: mean value (average gray scale value for each frame). Y: number of frames which have a particular mean value. Having discovered the technique of graphing the measurements of all the frames of a film sorted in value, we decided to apply it to other measurements of the same artifacts. Here we plot sorted center of mass data. (Center of mass is defined as "he brightness-weighted average of the x and y coordinates all pixels in the image.") Although a single measurement of the center of mass for one frame may not be very informative, a successive set of measurements indicates (very aproximately - but quick to produce) how the action is moving in X,Y over the time. The similarity of the five cartoons stands out even more clearly. 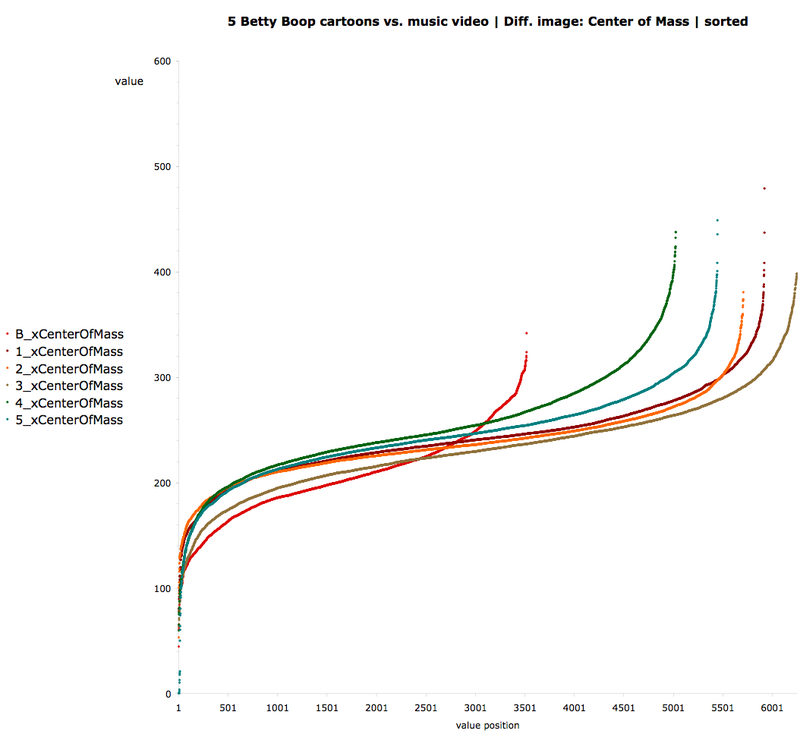 In this graph we are looking at all frames in five cartoons and all the frames from Biork video - projected on top of each other. The data plotted again is center of mass measurements. Now we discover something new. Althogh worked over with software, Biork's video is based on live footage of the singer, so in this way is typical of the universe of moving images which show people - who tend to walk on the ground. However, the cartoon universe is almost completely isotropic (invariant with respect to direction): the distribution of enter of mass measurements is symmetrical, were the characters are not bound by gravity. Here we plot center of mass measurements (Y value) over time. 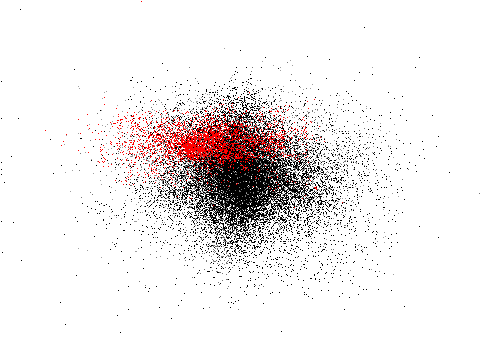 When data is plotted in this way, the opposition between the isotropic movement universe of the cartoons vs. non-isotropic universe of the humans is also clearly visible.